This past April, my husband and I enjoyed a long weekend along the banks of Lago Atitlán in Guatemala. Getting there from Guatemala City was a 5-hour, bumpy and circuitous ride up the mountains. When we arrived, it was almost dark, and the fog obscured a full view, but what I could see was beautiful. The lake seemed to go on forever. Lago Atitlán was once called “the most beautiful lake in the world” by German explorer and naturalist Alexander von Humboldt. Lago Atitlán is the deepest lake in Central America at 1,049 feet (320 meters) deep and is approximately 12 kilometers long. It is surrounded by villages whose inhabitants are Tz’utujil, an ethnic group of the Maya civilization. The vegetation is lush and abundant with fruit trees and flowering greenery. Coffee beans grow along the mountainsides and locals work at harvesting them for exporting. They say that this mountain top resembles the face of a Maya ancestor. We are a multigenerational collective of 48 women weavers from San Juan La Laguna. We work together to support each other and our families through the sales of our traditionally crafted textiles since 1971. We met Cristina, a member of the cooperative, who explained the spinning and dying process. The textiles are woven out of locally grown white and brown cotton. The cotton is picked, cleaned and hand spun with a support spindle and bowl, as demonstrated by Cristina. Cristina then explained each of the natural dyes used to add color. All of the dyes are extracted from flora that grows around Lago Atitlán. To obtain shades of red, they crush the seeds from the pods of the achiote tree (scientific name: Bixa orellana). The pulverized seeds are heated in water to produce rich reds. I was surprised to learn that the avocado seed produces a dye. The seed is dried and left until it begins to disintegrate. It is then ground and boiled to release a green dye. The buds and seed pods of the pericon plant (scientific name: Hypericum perforatum) produce green and yellow colors. The plant is native to Mexico and Guatemala and grows wild in previously cultivated land or near milpas. The bark of the ilamo (a type of birch tree) produces red and yellow dyes, from the outer and inner bark, respectively. Flor de Muerto (or Mexican Marigold) is used for yellow dyes. Sacatinta (scientific name: Justicia tinctorea) produces dyes of various shades, hence its common name (“saca” from the verb “sacar” meaning to remove or take out; “tinta” for dye). According to Cristina, you can get as many as five hues from one pot of sacatinta. We watched as the skein of cotton yarn began to turn a deep purple upon oxygenation. To remember our visit, we selected this textile dyed with indigo. It is meant to be a wrap although we plan to use it as a decorative element at the end of a bed. Cristina explained the motifs on the textile. The milpa (or maize field) is an ancient agricultural method of the Maya. Areas of land are cultivated to grow corn and other crops. After a couple of years of harvest, the ground is left fallow to regenerate itself. Typically, women use the back strap loom to weave while men use a larger foot-pedal loom. The figure of a woman, or ixoq in the Tz’utujil language, is a recurring motif. The árbol de ilamo, used so frequently for its dyes, is represented. The next motif represents a freshwater crab found in Lago Atitlán, followed by a fish. The last motif in this textile is of Tikal, a pre-Columbian city from the Maya civilization. To learn more, we brought home this book about the botanical dyes of the region. It is organized in three major sections covering natural dyes from trees, fruits and plants. Each section contains recipes for creating the natural dyes and examples of the colors that each produces. You can find the Asociación de Mujeres en Colores Botánico on Facebook (@ColoresBotanico). After the week-long MBA Field Study, my husband and I headed over to Antigua, Guatemala for a long weekend. Antigua was originally the capital of Guatemala until an earthquake destroyed it in 1773. This colonial city is surrounded by mountains and volcanoes. The city is full of history, beautiful architecture and ruins, abundant with arts and crafts, and culinary delights. We didn’t have time but I would like to return and tour a coffee plantation and climb the volcano. We stayed at the Hotel San Rafael. This former home boasts a lush and tranquil inner courtyard with fountains, wide walkways, ample seating areas, excellent food and large elegant rooms and suites. Here are the fountains in the center courtyard and the comfy sitting area outside our room where we spent evenings talking and enjoying cocktails. This smaller courtyard was behind our room. We could hear the soothing water from our bathroom window. If you do a search for Antigua, undoubtedly you will find photos of the Arco de Santa Catelina. This archway dates back to the 1600’s and was constructed so that nuns could cross the street without being seen. From a distance, you can see one of the three volcanoes that surround the city. The city’s spiritual center is the baroque church, Iglesia de la Merced, with its yellow facade. I don’t know if that giant rosary is a permanent fixture but it was a sight to see! The Iglesia y Convento de la Compañía de Jesús (Church and Convent of the Society of Jesus ) was destroyed by several earthquakes and rebuilt only to be destroyed again. What is interesting about these ruins are the headless saints. Many statues lost their heads after the earthquakes and they could not determine which head went with which statue so they were never replaced. One of the most beautiful and interesting ruins are that of the Iglesia y Convento de las Capuchinas (Convent and Church of Our Lady of Zaragoza) which was consecrated in 1736. I spent a relaxing morning exploring the ruins and gardens of the convent. After many twists and turns, I found my way to the Edificio Circular (Circular Building), the circular dormitories where the nuns lived. The nun’s “cells” were approximately 8′ x 10′ and had the most modest accommodations – an arched doorway, what appears to have been a narrow toilet, one or two niches presumably for religious statuary, and a small window. View of the mountains through the window of a nun’s cell. Standing inside a cell looking towards the inner courtyard. The bathing room was located near the circular dormitories. The sótano (basement) was particularly intriguing. A long flight of stairs led down to a barren circular room. The room is dark with only a couple of windows situated beyond reach letting in natural light. I heard that the basement was used to punish the nuns by leaving them there for extended periods of time. I don’t know if this is true but it was chilling nonetheless. As you might imagine, the city was abundant with arts and crafts. There were large warehouse-like stores filled with pottery, textiles, woodwork and more. There were countless smaller stores with beautiful hand crafted items. Everywhere you walked there were peddlers on the streets carrying armfuls of textiles. My favorite were the colorful tote bags made from upcycled huipils. With the abundance of textiles, several purveyors displayed the plants from which they made natural dyes such as achiote, cedar, ilamo and wood from the blackberry tree. In one courtyard, a woman sat at a back strap loom weaving. I watched for a long time as she methodically wove the multi-colored threads on her loom. A relaxing and fun weekend after a week of interviews and translating. The capstone assignment for the MBA program was a team-based global business project. For our project, our client was a private equity firm that invests in companies with growth potential primarily in Latin America. Our charge was to develop a country expansion strategy for one of the companies in their portfolio. To accomplish this, we spent a week in Guatemala conducting a field study. We interviewed key stakeholders – the CEO, CFO, clients, partners, third-party administrators, vendors and others in their supply chain. It was an immersive week where we learned a tremendous amount and were able to apply the concepts learned in our MBA courses. My husband accompanied me on the trip and we arrived in Guatemala City a day early so that we could take in some of the sights before my busy week began. Here are my impressions of Guatemala City. First, there’s the foliage. The city is lush and green, and the leaves are huge! These are the very large leaves of a monstera deliciosa (otherwise known as the swiss cheese plant). My husband and I stayed at a lovely boutique hotel called La Inmaculada. The ambience, service and food were wonderful. I took these photos in the inner hotel courtyard where we had most of our meals. The rooms were not as fancy as some of the big-name hotels, but they were clean and had everything we could possibly need. Guatemala is renowned for its coffee – and it was delicious. We drank freshly ground coffee in the courtyard every day. Here, a late-night craving for sweets – a warm latte paired with fried plantain covered with cinnamon and a dab of fresh cream. We took an excursion to the Mercado de Artesanias La Aurora, a beautiful arts and crafts market next to a rose garden. We practically had the place to ourselves. Coffee beans growing in the garden. At the market, we were overwhelmed with colors and textures from all the hand-woven textiles and crafts. We bought this little hacky-sack turtle for our puppy. It didn’t last long. I managed to get it away from him before he destroyed it. Now the turtle is missing one leg. We brought home several textiles including these cloths to place in a basket with bread or tortillas. This queen size textile will serve as a light, cool bedspread during the summer. One of my favorite parts of travelling is street food, and Guatemala did not disappoint. There were snow cone vendors all over the main plaza in the historic district. I had one with tamarindo and pineapple – yum! The smell of freshly baked bread permeated the air. As we walked through the historic district, families outside a church were selling these handmade tamales. I did not resist. This gentleman was leading his goats through the downtown area. For a few quetzales, you could have a fresh cup of warm goat’s milk. Dinner consisted of a chicken breast covered in an exquisite cream sauce with loroco – a wild vine of edible flowers. Restaurant: Café Kacao. My husband’s meal was smothered with an anacate cream sauce. Anacates, or chanterelle mushrooms, were in season. One night, I had a traditional mole dish. You can’t visit a country in Latin America without visiting churches. The baroque Metropolitan Cathedral of Saint James dominates the city center. That particular Sunday was the feast day of Santo Domingo. My husband and I joined the jubilant procession through the streets. A few blocks over we passed Rectoria Santa Clara, a Catholic Church in the historic district. Construction of the church was completed in 1734. The streets had so much character. During the week, while I was busy with the field study, my husband took a side trip to Santiago Atitlán, one of several Mayan villages surrounding beautiful Lake Atitlán. Lake Atitlán is in the Guatemalan Highlands at an elevation of 5,105 feet (1,556 meters). Three volcanoes are situated around the lake. Part of the reason my husband selected Santiago Atitlán was to visit Cojolya for me. Cojolya is a cooperative of 30 artisans, 25 of whom are women, who weave beautiful and intricate textiles using the traditional back-strap loom. My husband took a photograph of one of the women, descendants of the Mayans, weaving a vibrant textile. While the women weave on the back-strap loom, the men weave on large foot looms. My husband said he had a great time talking with the weavers. He also enjoyed the serenity of the town by the lake surrounded by mountains. Being the amazing husband that he is, he brought me back these items he personally selected – a gorgeous scarf hand embroidered with local birds, an intricately woven catch-all bag, and an exquisite blue woven scarf. He bought them straight from the women who created them – what a treat! I had scheduled this post before I heard the news of the volcano erupting near Guatemala City. My thoughts and prayers go out to the families who lost loved ones. Visiting Mexico City means taking in the larger-than-life murals of Diego Rivera. We visited three locations featuring these exquisite frescoes. The Palacio Nacional (National Palace), which houses the office of the President and other cabinet departments, contains a historical timeline of Mexico as depicted by Rivera. It is difficult to capture the grandeur of these detailed murals of the Mexican civilization. I will share only two murals with you, one showing the indigenous cultures that flourished before the Spanish conquest, and one after. After the Mexican Revolution Rivera was concerned with two issues, and these determined his artistic themes: the need to offset the contempt with which the conquistadors had viewed the ancient Indian civilizations, and the need to offset the anti-mestizo and anti-Indian attitudes of the European-oriented ruling classes during the porfiriato (the dictatorship of Porfirio Diaz). Ruins of the structures depicted can be found at El Tajín, Veracruz. At the Museum of Anthropology, we saw the rings and balls used in the ball courts in the upper left corner of the mural. … he depicts in dramatic fashion the violence and exploitation of the Spanish conquerors. Natives hanging in the background, the branding of the native in the foreground, and the reduction of the indians to slaves and pack horses show the cruelty and savagery of the Conquest. At the Palacio de Bellas Artes, a magnificent art deco building that hosts visual and performing artists, is the famous mural, “Man, Controller of the Universe.” This is the recreation of the mural that Rivera painted at the Rockefeller Center and which was destroyed in 1934. It is almost impossible to capture the entire mural given its size and frequent visitors, so I show you the panel that caused the controversy. Man at the Crossroads … is a whodunit tale that also illustrates the tensions between art and politics. If you are ever in CDMX and want to get unobstructed views of Rivera’s murals, go to the Ministry of Public Education, a few blocks away from the National Palace. We had the entire grounds practically to ourselves. The building has two large courtyards with Rivera’s murals covering several floors in each. While all of the frescoes have their own story, these were my favorite. They depict the daily arts of dyeing and weaving. 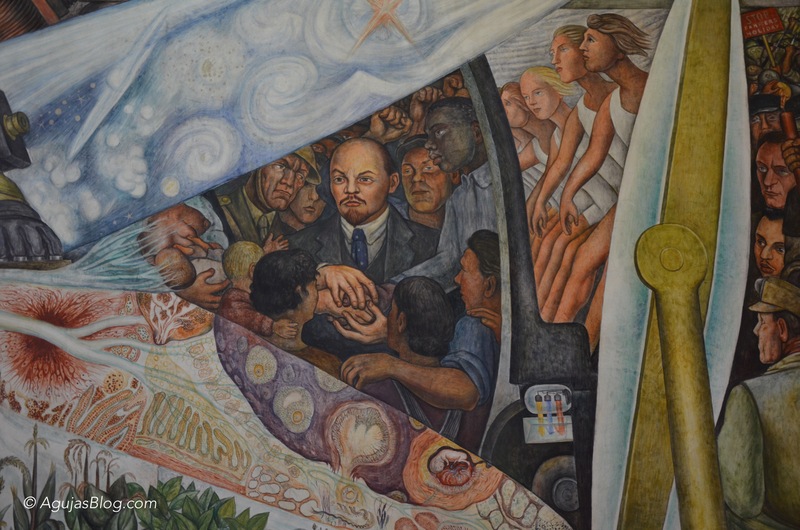 The one mural I have not seen is Sueño de una tarde dominical en la Alameda Central (Dream of a Sunday Afternoon in Alameda Central Park) located at the Museo Mural Diego Rivera. Therefore, I must return to CDMX one day!